Make the dough: In a food processor, pulse together flour, cornmeal, yeast, and salt. With processor running, add oil and then 2 cups cold water in a steady steam; process until dough just forms a ball. Divide dough into four equal portions; roll into balls, and cover with a clean kitchen towel or plastic wrap until puffed, about 20 minutes. Preheat oven to 500° . Place each dough ball on a baking sheet; using your hands, gently flatten, and pull into 8-by-10-inch ovals. Top as desired. 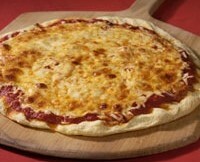 Bake until crust is golden brown and toppings are hot, rotating sheets halfway through, 10 to 12 minutes.